Buy this BUNDLE and SAVE $$$!!! This is the perfect activity to keep kids busy!!! This is ideal for early finishers or brain breaks. Students will love to draw a character from the very popular game FORTNITE! 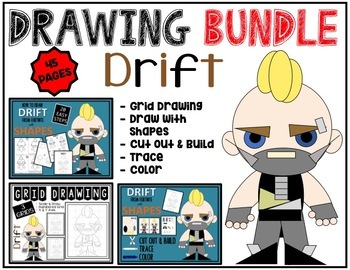 Enjoy this bundle with fun FORTNITE DRIFT drawing activities. Included in this bundle are 3 packets: GRID DRAWING; DIRECTED DRAWING WITH SHAPES; CUT OUT, BUILD, COLOR & TRACE. 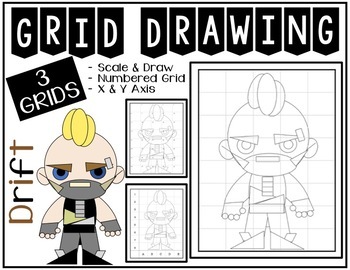 This packet includes 3 different grids (basic grid, numbered grid, and X & Y axis grid) to draw the same character. The grids are available in full page size and half page size. Once students are done, they can color the character as they want. This is ideal for students to follow directions and also for students who cannot draw characters by themselves. To reuse, I recommend you laminate the grid papers with the character. Easily print, laminate (optional) and hole punch the step-by-step cards to make a cute little booklet that can be reused by anybody at any time. Use a metal ring to keep the cards together. 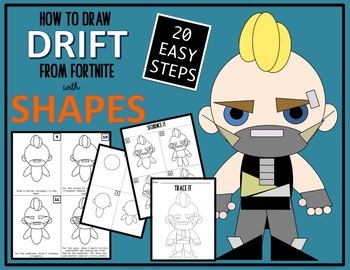 Students can follow 20 easy steps to learn how to draw DRIFT from FORTNITE. This complete packet will allow students to draw the object by following 20 easy steps, learn about order and sequencing, and draw by themselves and/or as a guided activity with the teacher and whole class. 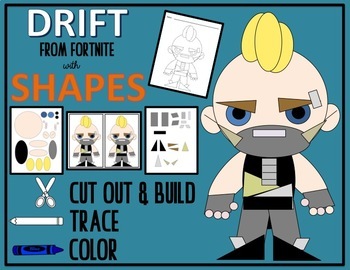 Students will use their fine motor skills to CUT OUT, BUILD, COLOR and TRACE a character from the very popular game FORTNITE! Easily print all the pages and have students cut out the pieces and use the colored picture as a guide to build DRIFT from Fortnite. Students can do this individually or set the timer and have some friendly competition between friends to see who can build their character the fastest!